National Car Care Month: Are you ready for wet spring driving? April is National Car Care Month and spring is finally here! Most drivers know to take precautions and be prepared for winter driving, but spring driving comes with its own challenges. When spring cleaning, don’t forget your car. Winter took a toll on your car. Here in New England, in addition to Mother Nature your vehicle had to contend with regular road salting and sanding. 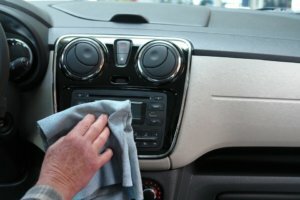 Take the time to properly clean it inside and out. It’s not just about looking good. Regular detailing will keep rust at bay and make your interior last longer, extending your vehicle’s life and protecting its value. While you’re cleaning your car, pay special attention to your headlights. Old, dim bulbs and cloudy lenses will greatly reduce your ability to see and be seen in foggy or rainy weather. If it’s time for new bulbs, replace them in pairs. 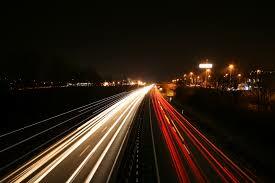 Unbalanced or unpredictable light beams are a safety risk to both you and other drivers. Depending on your typical driving conditions and the age of your vehicle, your headlights will eventually need restoration. Cloudy headlight lenses hinder night vision and can reduce their effectiveness by as much as 80% according to Consumer Reports. Request headlight restoration when you schedule your next service appointment. While you’re checking your headlights, take stock of your wipers’ condition. Temperature extremes break down the rubber, giving wiper blades about a 6 month useful lifespan in our region. Worn out wipers can’t clear the window effectively enough for good visibility in torrential rain (and can scratch your windshield over time). Time for a tire changeover. If you have snow tires on your car, change them back to all-season or summer tires. There’s no specific time to do this, as it depends on the weather that year. It’s not unheard of to get snow well into March or April. Summer tires perform best at 50 degrees and above, and can be put on when the nighttime temperature is consistently above freezing and the long term forecasts are showing the same. It’s also a good time to take inventory of your emergency kit. Emergencies and evacuations can happen anywhere, at any time of year. Swap out the ice scraper and salt or kitty litter for extra water, and restock any supplies that were used or have expired. 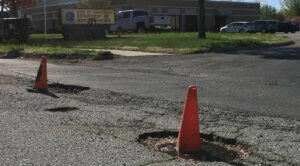 Spring means roads littered with potholes. When you can’t safely avoid them, try to slow down before impacting deep ruts, releasing the brakes before you hit. This allows the wheel to roll through rather than lock up when it drops into the hole. Be sure your tires are properly inflated and that your vehicle’s suspension parts are in good condition. They’re more likely to survive the impact if they’re up to the task. Worn shock absorbers provide little protection against an encounter with a rut or pothole. And when possible, report the location of dangerous potholes to your local municipality. Road construction season has begun. By mid-spring road construction and public works on highways and local streets will be in full swing, narrowing roadways and introducing more hazards. Expect delays and plan your travel time accordingly. Alter your route to avoid construction areas when practical, and when you can’t, slow down, limit distractions inside the vehicle, and stay alert for workers and instruction signage. April showers bring slippery roads. We’ve already begun to get the extended spring rains this year, and driving in the rain can be a potentially serious hazard. In the first few minutes after it begins to rain, the water mixes with motor oils and oil from new asphalt, resulting in a surprisingly slippery roadway even from a relatively small amount of rain. Anticipate this possibility and drive at a speed suited to the conditions. Long, heavy downpours wash away the oil and reduce slipping, only to introduce the hazard of moving or pooling water on the roadway. Hydroplaning occurs when there is more water on the road than your treads can channel away. This relationship is effected by your vehicle’s speed across the water, the pressure in your tires, and your tire tread depth. When hydroplaning your tires are riding on top of the water without contacting the road surface, severely diminishing or even eliminating your ability to steer or brake. Drive at a safe speed for conditions, and check your tire pressure monthly. The correct pressure for your car is not on the tire, but inside the driver door jamb. Use the penny test, and replace your tires before their tread gets below 2/16”. You can further reduce your chances of hydroplaning with your lane choice. On a highway, stay in the middle lane, which is usually higher than the left or right to channel water off the road. You can also follow in the treads of the vehicle in front of you (at a safe distance) where they have already displaced some of the water. Heavy rains can cause pooling along the sides of the roadway. 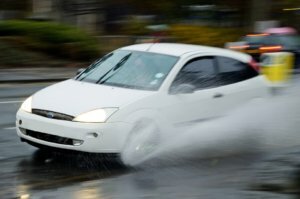 Hitting large puddles at speed can cause hydroplaning, and worse are the unknown dangers it presents. You can’t determine the depth of the water just by looking, or if the water is covering a deep pothole or sinkhole. Driving through excessively deep water can completely ruin your engine. Go around major puddles whenever it is safe to do so, or navigate them at a substantially reduced speed if you can’t. Take care of your car this April and have safe spring travels. Come to Hillside Automotive in Hartford for service and our expert mechanics will perform our 50-point courtesy inspection to make sure that you and your vehicle are ready for the rain. Call Bob at 860-951-1083 for an appointment or schedule online today.